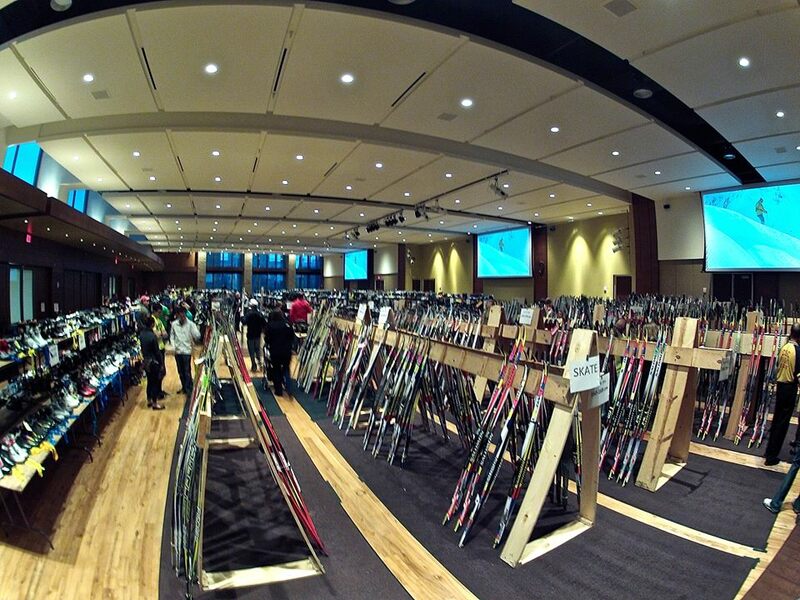 Adult and children’s skis displayed at the resale. 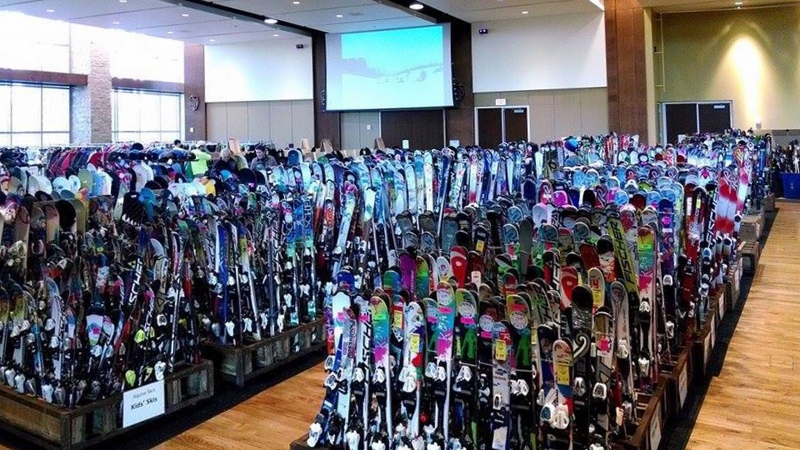 The 52nd annual Hoofer Ski and Snowboard (SnS) Resale is coming up on the first weekend of December, where over 6,000 ski and snowboard items will be displayed in Union South’s Varsity Hall. This two-day event is the largest of its kind in the Midwest, attracting hundreds of shoppers from all around who are looking for gear for the season. Organizing this major event falls on a five-student subcommittee within Hoofer SnS. Mitch Beres, a UW-Madison senior and the resale director, said that planning begins in the summer – about five months before the actual event. “I keep it in the back of my mind until about July, and then once July kicks in, that’s when I need to start making the reservations for everything,” Mitch said. Mitch will also contact the vendors during that period, to figure out what items and how many workers they will be bringing. Each vendor brings employees from their stores to help shoppers find out what gear works best for them. Typical items for sale include skis (downhill and nordic), snowboards, boots and some apparel. In addition to the vendor employees that work at the resale, Mitch said that about 100 volunteers will help each day with various aspects of the event. Some of the volunteers are community members, but the majority are students and Hoofer Club members. Mitch said that they are trying to get together a few training sessions before the event to teach volunteers how to correctly size skis and snowboards for customers. Shoppers browse the aisles of ski and snowboard gear. The resale has been a success for over half of a decade, but Mitch and the resale team have worked to implement some changes to make the event even better this year. Mitch has been involved in the resale in some way or another since he was in high school and has noticed over the years that there are many items that are not sold by the time the event ends. And, with thousands of items packed into one space, the room can become pretty crowded. “I’m trying to limit the amount of items the vendors are bringing this year to make it less cluttered,” Mitch said. One of the assistant directors, UW-Madison junior Connor Gallagher, is an engineering student and decided to build additional snowboard racks for this year’s resale. He noticed that the old racks were falling apart and that there was an opportunity to better display the boards. All of this planning takes countless hours beyond the resale team’s regular school workload. Time management, task delegation and teamwork have been key to the event’s success. The 2015 Hoofer SnS Resale is on Saturday, December 5th from 9 a.m. to 6 p.m. and Sunday, December 6th from 9 a.m. to 3 p.m. at Varsity Hall in Union South. For more information, visit http://hoofersns.org/resale. Lilly is a UW-Madison senior studying strategic communications and reporting in the Journalism school and is completing a certificate in digital studies. You will often find her studying or spending time with friends in the various nooks and crannies of Memorial Union with a heaping bowl of mocha macchiato Babcock ice cream.